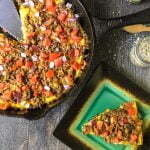 This low carb bacon cheeseburger frittata is a fun way to eat your burger without the bun! But the flavor is all there and it's only 1.3g net carbs per slice. Mix the eggs and cream until well combined and add to large oven proof skillet. Cook over medium heat for about 5 minutes until the sides start to set a bit. Put into the oven and bake for about 15 minutes. You don't want to over cook it but it should be set in the middle. In the meantime, brown the meat and make the bacon. When the frittata comes out of the oven, top with your ground beef, bacon and cheese. Place under the broiler for about 5 minutes until the cheese melts. Take it out of the oven and let set for 5 minutes. Top with your favorite burger toppings like lettuce, tomatoes, onions, etc.